Here are a few items I had saved to share, but hadn’t gotten around to yet. Skylands Park, once home to the New York-Penn League New Jersey Cardinals and later the Can-Am League Sussex Skyhawks, but mostly vacant since 2010, has changed hands again. The Star-Ledger reported last week that a group including the organizer of State Fair Meadowlands paid $850,000 for the ballpark, 28 acres of land and a liquor license. Sussex Community College’s baseball team is likely to be the only one to call the park home in 2014, but Frank Boulton’s proposed Diamond League remains a possibility for 2015, according to the article. 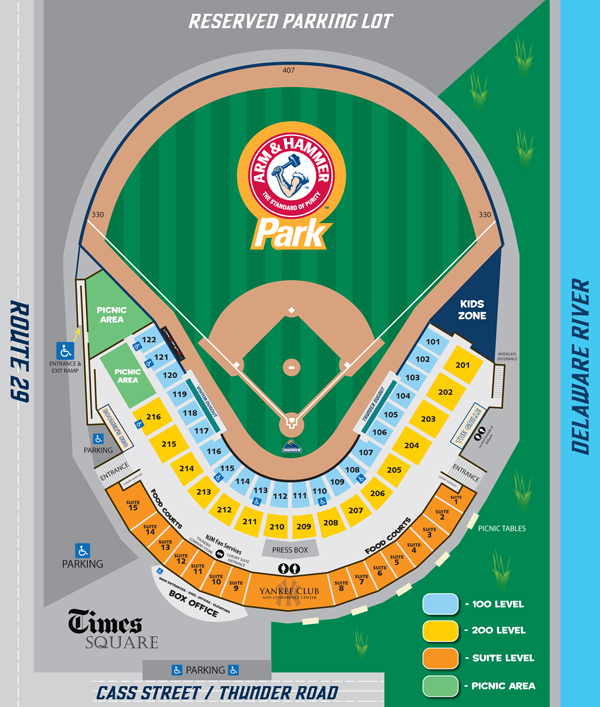 I’m still getting used to calling it Arm & Hammer Park, and now the Trenton Thunder are going to make me get used to new section numbering, too. The ballpark originally identified its field level section by a number from 1-22, and the sections above the walkway were identified by a letter from A-R. Next year, all the sections of the park will be numbered. Following the popular convention, field level seats will be in sections 101-122; upper level seats will be in sections 201-216 and the luxury suites will be numbered from 1-15. A friend made me aware of the Veteran’s Ticket Foundation, a 501(c)3 non-profit organization that allows people to donate event tickets and gift certificates that would otherwise go unused so that military veterans and their families benefit. It’s a good cause for those of you looking for something to do with tickets to games you can’t or don’t want to go to.